A vineyard wedding is perfect for anyone who is looking for a romantic, fairytale day. The blend of vines, magical scenery and delightful, hidden reception choices all combine to make a vineyard wedding one to remember. 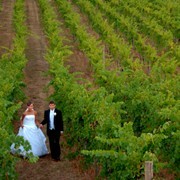 And choosing an area to hold your vineyard wedding couldn't be easier when you have the Hunter Valley at your doorstep. The Hunter Valley Wine Country in New South Wales is a popular destination for weddings, and for good reason. The area boasts amazing scenery for as far as the eye can see, as well as a plethora of reception venues and ceremony location options. You are spoilt for choice when planning your wedding in the Hunter Valley and in fact, the hardest part will be making the final decision on which breath-taking option to choose. You can have a ceremony in one of the quaint chapels that are dotted throughout Pokolbin and surrounding areas, or you can choose to have an outdoor ceremony in a location of your choice. Many of the chapels are small but charming buildings situated right within the vineyards themselves. This makes for some pretty amazing photos when you step outside the door right into the thick of the vines and the luscious surrounds. In some places you will even have a view of the rolling hills from inside the chapel while you are saying your vows. 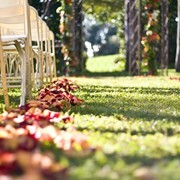 A wedding in the Hunter Valley also has the added benefit of a weekend away for you and all of your guests. There is a variety of accommodation available throughout the entire Wine Region. You can choose to stay in a motel, a hotel or a boutique B&B. For larger groups, there are houses that can be hired for the weekend right in the middle of the vineyards. This will ensure a memorable weekend for all people involved, especially if there is time for group activities over the weekend. This could be horse riding, cheese sampling, cooking classes or of course wine tasting. Guests who have never been to the Wine Region before will be guaranteed to be taking home some keepsakes from their weekend away. Aside from the romantic scenery, the cute hotels and the group activities, a vineyard wedding can be great for one more reason - theming. If you like the idea of having a theme running throughout your wedding then a vineyard inspired theme might be just for you. Vines and bunches of grapes can adorn everything from the wedding invitations, to the decorations at the reception venue and also be placed on the cake. Special wine from the nearby wineries can be offered to guests to go with their meal and wheels of cheese can be cut up for dessert. Whatever area within the Wine Region you choose to hold your vineyard wedding in, it is guaranteed to be a beautiful occasion and one you and your guests will never forget.